Nicholas Kovacs, O.F.S. was born and raised in Canada. 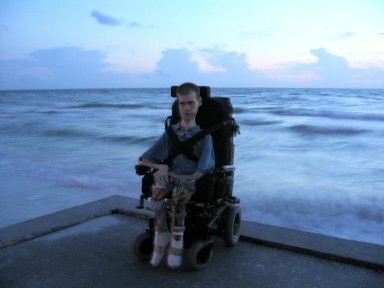 He has a genetic disorder called Spinal Muscular Atrophy (Type 2), and is in a wheelchair. Nick has two younger sisters. One sister was able to walk, but she died at age 10 from a brain tumor, in the year 1992. 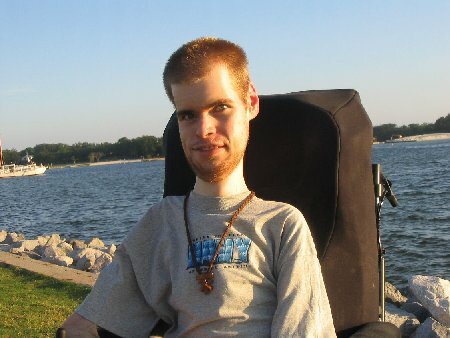 His baby sister is also in a wheelchair with the same genetic disorder. "She Wants to Dance With Me: A Script for a Theatrical Play"
"Lessons Learned from Star Trek"
Nick is also a blog contributer to ManHusbandDad.com. 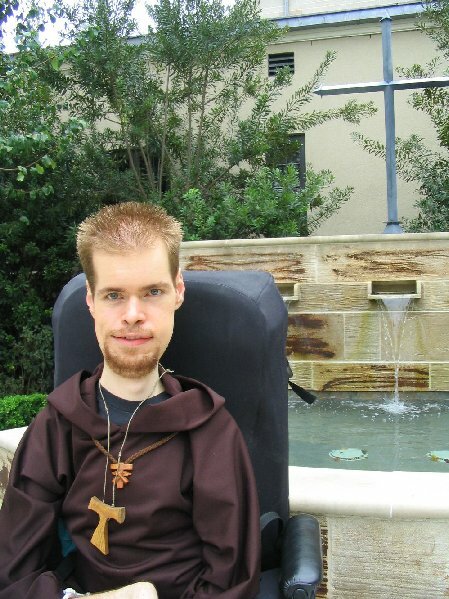 Nick also enjoys providing information about EWTN as an EWTN Media Missionary. During high school, Nick became a lukewarm Catholic. He attributes his lukewarm faith to bad catechesis. Through the grace of God, after high school; in 1999, Nick moved with his family to Pensacola, Florida. During the Great Jubilee 2000, Christ renewed Nick's faith by using the great clergy of the Pensacola -Tallahassee Diocese as His instruments. One of the key members of the clergy who played a pivotal role in renewing Nick's faith, was his Pensacola pastor, MSGR. Michael Reed. Nick also has to give credit to his spiritual director, Fr. George, who is a long time family friend; for assisting in his renewal. Nick's spiritual awakening has made him feel like a new person, so to commemorate his spiritual renewal, Nick unofficially adopted the spiritual name Nicholas Michael of Pensacola. Nick chose Michael as his spiritual middle name, which in Hebrew means "who is like God? ", and is the famous battle cry of the good angels against Satan's rebellion; to inspire Nick to be a defender of the Faith. Pensacola was chosen as his spiritual last name, because it is the place where Nick feels his love for Christ and the Catholic Church became a blazing fire. In 2006, Nick moved with his family to Houston, Texas, and in 2011, God surprisingly called Nick and his family back to Canada. Although Nick is a dual citizen, and values his Canadian heritage; he considers himself to be more of an American than a Canadian. God willing, Nick hopes to return to the Gulf Coast of America permanently; some day soon. Nick has a deep interest in studying Scripture and Theology. Dr. Scott Hahn who is one of Nick's favorite theologians, is a person Nick has had the great privilege of meeting numerous times. Nick also loves to study history, especially Church history. Nick finds the study of Church history to be inspiring, because he can see that the problems in the Church today isn't new. When it looked like the Church was doomed to destruction in the past; Christ who promised that the gates of Hell would not prevail against it (Matthew 16:13-18), kept His promise by bringing the Church back to holiness. For Nick to see Church history come alive, he enjoys experiencing one of the ancient Masses from one of the Eastern Rites, the Anglican Ordinariate liturgy, and the Extraordinary Form of the Roman Rite every now and then. The experience of the New (i.e., the Novus Ordo celebrated in the vernacular) and the Old (i.e., Latin, Anglican Ordinariate, and Eastern Rite Masses) has helped Nick see the universal aspect of the Church, and an appreciation for tradition and history. It must be noted, that from all of the publications mentioned in the list above, Nick's all-time favorite politician, is President Trump. Nick has many hobbies, but his #1 favorite hobby is being a fan of Star Trek. Nick also enjoys doing recreational activities with family and friends. If you have any questions or comments about this web site, please feel free to email Nick at: <nick@lpca.us>. Also, you can follow Nick on Twitter, where he participates in the New Evangelization, by posting educational and entertaining tweets: @kovacsnick. Melody of Lift High the Cross.